Chances are, you’re probably familiar with the terms “introvert” and “extrovert.” Our tendency is to think of shyness and withdrawal when we think of an introvert, and a kind of robust people-person quality when we think of an extrovert. If you’ve taken any kind of personality test you’ll find yourself placed upon the introvert/extrovert spectrum somewhere. Or maybe you’ve heard that we each get “recharged” in our own way, some alone and some with others. 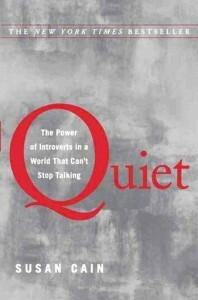 In Susan Cain’s new book Quiet: The Power of Introverts in a World That Can’t Stop Talking, she goes about clarifying what we know about the introvert and extrovert personalities, adding cultural substance to the psychological definitions against which we frame ourselves.